Exciting news! Today, I’m reviewing the fantastic Karen Tyler Montessori Teacher Training Program, and 1 lucky Mummy (or Daddy) stands to win a seat in her online class, worth USD150! I’ve been attending the program since 1 December 2011. It complements The Shichida Method that we’re using very well, provides a comprehensive homeschooling curriculum, saves me TONNES of time researching, and Vee’s enjoying the activities every day. Read more Montessori education at Wikipedia here. Receive a 12-volume set of Montessori Albums covering Astronomy, Botany, Ecology, Geography, Geology, History, Language, Mathematics, Physical Science, Practical Life, Sensorial, and Zoology. For more details, visit the course specifics here. You may download the Table of Contents for the albums here. Rating Guide: ★ Oh no! ★★ Poor ★★★ Fair ★★★★ Good ★★★★★ Excellent! (a) Program Contents: ★★★★★ I signed up as a Fast Track student to complete the course within 12 months. Vee’s almost 3 years old and learning like a sponge. I need to make full use of this “sensitive period”. If your child is younger (say less than 1 year old), you may choose to complete the course over 24 months. The 12 albums contain thousands of pages of activities, all in PDF files. I like that they’re very comprehensive, even covering subjects such as Astronomy. This way, I can choose the activities based on Vee’s interest at that point in time. Even on the Fast Track route, I find the readings very manageable. I usually spend 15 to 30 minutes a week on the assigned readings (mainly presentations of activities in 1 to 2 albums). I prefer to read them using my iPad anytime, anywhere, instead of printing them. Once I identify suitable activities, I’d proceed to prepare or buy the needed materials. I love the many FAQs that Karen has uploaded at the beginning of the course. 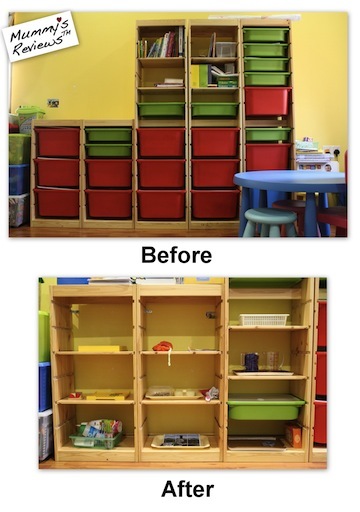 These gave me a good idea on implementing the Montessori Method at home. (b) Effectiveness: ★★★★★ These few months, Vee’s very interested in imitating adult activities such as pouring, sweeping the floor, and using locks and keys. The ideas in the Practical Life album are perfect for us now. I’ve effectively taught him how to cover his nose when he sneezes, stand up properly, walk in a straight line, etc. Before using the Montessori Method, it could be frustrating teaching him these seemingly simple things. Karen’s albums provide step-by-step instructions on how to present each activity. These are very easy to follow. I like that our homeschool environment is now much more effective, and Vee has become a more independent learner. (c) Service: ★★★★★ Karen’s very responsive with questions asked in emails and the Yahoo Group forum. She usually replies within a day or two. And if she’s on vacation, she’d inform everyone, and even clears emails during vacation! (d) Overall Value: ★★★★★ The price of the program ranges from USD150 (paid upfront) to USD240 (paid monthly). The albums, which are packed with activities, are already worth the price. Moreover, it frees up my time researching, thus spending more time implementing the activities instead. At this price, I can’t find any other comparable course. The program is superb value for money and I highly recommend it. To thank supporters of Mummy’s Reviews™ Parents Club, this Giveaway is EXCLUSIVE to Parents Club members. ONE (1) lucky member will win a seat in Karen Tyler’s Montessori Teacher Training Program that starts on 1 March 2012, worth USD150! This Giveaway is open to subscribers worldwide (except in countries that don’t allow participation in lucky draws / sweepstakes). I’d choose the entry with the best supporting reason to win the seat. If I really can’t decide, then the winning entry will be chosen randomly. It will run until 10 February 2012 (Friday) 2359hr (GMT +8). The usual Giveaway Terms apply. Submit your entry now and good luck! I have a toddler (1.5 yo) and a preschooler (4 yo) whom I homeschool currently. We are implementing a very light montessori approach, whereby I will scour the net for resources and ideas, and just use everyday items at hand for the materials. It would be very beneficial and advantageous for me if I could win this program and like you mentioned may be able to help cut down my research time and put into practice more instead. Congratulations, Siti! You’d receive an email on how to attend your course on 1 Mar 2012. To other Mummies and Daddies, you may contact Karen to enrol in the upcoming class. The course fee is as low as USD10 per month. I’m thankful that Karen has kept the program very affordable so that more parents and children can benefit from it. Have fun learning and teaching! To join Karen Tyler’s Montessori Teacher Training Program, visit World Wide Montessori Online. For enquiries, you may email Karen at karen [at] amontessorimarketplace [dot] com. P.S. Read more on homeschooling. Disclosure: I paid for my own training course and did not receive anything from Karen Tyler for this review. I simply love it very much and wish to share this information with other parents. Mummy’s Reviews™ is a review site that receives compensation if readers make purchases from affiliate links (these are marked with an *). If we receive compensation from the companies whose products we review, this would be disclosed. These compensation help to maintain and grow Mummy’s Reviews™. We test each product thoroughly and give ratings according to our experience with it. We are independently owned and the opinions expressed here are our own. Thank you MieViee for spreading awareness about this wonderful program! I already registered and will have my fingers crossed! Hi MieVee, thank you for the informative input, as usual. Now I just realized that it can work well for a 2 year + toddler as well. My girl is attending the Shichida class now after I found it out through your blog, and I think it’s going very well. Although I do need extra time for home practice as I tend to work late. If one day I become a SAHM, I will definitely consider this program! This is sooo exciting!! Hope I’m the lucky winner!!! Anyway got a nice surprise when I checked my inbox just now. Thank you for the bonus Geography album! MieVee, thank you for sharing and offering this training class. Your reviews save me a lot of time to research around and definitely introducing good products to new mummies like me. Xīn nián kuài lè 新年快乐! Do you mean the Parents’ Club form? I’ve submitted it. Just wondering did u hv trouble registering for the course? I hv sent an email to karen and had a return to recipient email. Also sent to the email training@worldwidemontessorionline.com but still no reply. Wondering whether there is any other way to contact Karen to find out my status. Hi Jin, my registration went smoothly. Several of my friends have also enrolled successfully in the course (some Dec 2011, some Mar 2012). She just updated my class that she’d a busy weekend and has started updating us today. Usually, she emails us on Monday instead of Tuesday. I’d send her an email with your email address to ask her to revert to you. Hi , i am wodering whether is this course suitable for 12 1/2 month old ? I am a stay at home mom and i would like to home school my daughter but i am not sure how to start off for a 12 month old girl . would really appreviate it if you could guide me a little. Also, for a young toddler, you may wish to explore early right brain education because this is the peak window for development. It also enhances the senses and having an excellent memory sets the foundation for absorbing all the various subjects explored in Montessori. Thank you for your resourceful blog! With Karen’s training program, does it require alot of time on your part to read and prepare the lesson? Did you consider sending Vee to a montessori-kindy? What would you do to expose them socially, other than kindermusik? thanks for any insights you can offer! Hi Cindy, you’re most welcome. Reading the materials doesn’t take much time, partly because I read rather fast and do a lot of scanning. Preparation depends. With materials on hand (e.g. already bought the Montessori or other necessary materials), it’s easy to prepare the lesson. If need to make own materials (usually to save money), then it takes more time and effort, which I’m lagging behind now because of 2 kids. Am going to catch up more when baby is older. Montessori is an education philosophy. Even without specific lessons, it’s still possible to use the method to educate the child throughout the day. Currently, I use Karen Tyler’s ideas mainly to inculcate manners, respect, attitude, diligence, etc., which are all important life skills. A true-blue Montessori kindergarten in KL is out of our budget. Moreover, I prefer to blend right brain education with Montessori, which is not available today, so homeschooling is our best option. Of course, there’re other reasons too, which I may share when more time permits. As for social interaction, Vee interacts with adults at home, his cousins of similar age (who are our next-door neighbours), his younger sibling, and classmates from Shichida and music classes. I also regularly arrange play-dates for him, with children around his age. I’ve read articles supporting homeschooling that very young children actually learn positive social skills and values from more mature individuals. They can better handle social situations involving less people. When older, then slowly increase the number. This is consistent with what I observe with Vee. He gets a bit hyper when there’re too many kids. With a cozier number (e.g. 1 to 2 other children), he plays much better and is calmer. At this age, he also picks up negative behaviour easily, so with homeschooling, it’s easier to “choose” his friends for him until he’s more mature, this creates a positive social environment. Also, being in a school simply exposes the child to a huge number of children, but doesn’t necessarily teach social skills. I’m one example. Introverted by nature, in school, I hardly talked to others, and the teachers certainly didn’t teach me how to interact. I only grew more sociable in my teenage years but EQ was still low. Only after meeting my mentors at work, plus reading and training, then my personality became more balanced. P.S. New posts on education will be published at MummysHomeschool.com. “See” you there! Hi MieVee, Thanks for this review, it’s very helpful! I was wondering if you could recommend a starting point (book? materials?) for me looking into using Shichida method at home. I live half in Japan, half in Australia, and have a 2 yr 10mo old with a short attention span, so from what I’ve read in your great blog, I thought I should try the Shichida method. Thanks for sharing great info! You may try reading some of the books mentioned at Shichida’s website here. I’ve only read the Chinese books, so am not sure if they’re similar. Living half in Japan is fantastic! You should be able to find out more from the locals? And a Japanese can buy materials from Shichida centre without being enrolled as student (unlike in Singapore and Malaysia). May I ask what is the difference between this Montessori program and just following activities on Montessori website? I have bought some books with such activities but I guess the program by KAren is more specific? Also, do i have to go and purchase many new materials or I can download from her website? I guess I am a bit cautious to spend that amount of money without being able to see any details of the syllabus first…. Hi yuu_ni, this is the new website for Karen Tyler’s Montessori program: http://khtmontessori.com. You may find out the syllabus there. There may be lots of info online nowadays, but scattered and may not cover as comprehensively as a training program with detailed albums, photos and printables for 12 subjects. That’s why I prefer to save time surfing online and simply rely on her program most of the time. I especially like the detailed FAQs on how to handle children when teaching them. Sometimes, when I’m not sure about a specific presentation, I’d email her to clarify or surf online for alternative ways. Her albums include many printables. That said, for the “serious” homeschooling mum, there are quite a number of Montessori materials to be bought or made. Reason: many Montessori materials need to be 3D, not just as a 2D printable. E.g. For Sandpaper Letters, she provides the printable pattern for the letters, which I printed out to make the actual sandpaper letter set. What to buy / make / skip depends on your preference and budget. As part of the FAQs given at the beginning of the course, she gives suggestions on what she thinks is more essential, which I find useful. The Table of Contents of her albums can be found here: http://www.alisonsmontessori.com/Downloadable_PDF_Files_s/63.htm. Go to each subject album and click on the image. Hi MieVee, I would like to sign up the KHT montessori class this year. Would appreciated if you could share your coupon code, if you have any. It is ok! I just signed up the course. Hopefully I can complete the course in a manageable time. My baby is currently 10 months plus and I’m thinking of signing up for Karen Tyler’s class which currently is a 12 months Programme. I’m wondering when is the best time to enrol for her class, just before baby turns 2 or right now even before she is 1 or somewhere in between? Hi joyce, apologies for missing out on replying you. Life has been real busy homeschooling the kids. On hindsight, I’d go for the class early to be better prepared. Also when the baby is less mobile, sleeps more and needs less attention. All the best!